I am back with another round of swatches to share with you. I came across a new to me brand called as " Pear Nova". Pear Nova Blue Magic - A gorgeous periwinkle blue creme. Shown here are 2 coats plus top coat. 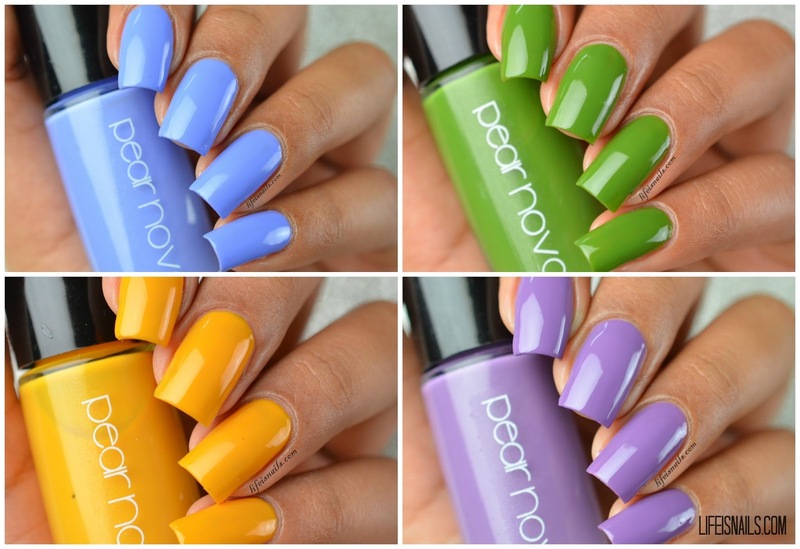 Pear Nova Beach Babe - An iris colored creme. Shown here are 2 coats plus top coat. Pear Nova Perfect Stranger - A stunning leafy green creme with gold shimmer in it. The shimmer was hardly visible on the nails, though, but other than the color looked great. Shown here are 2 coats plus top coat. Pear Nova Heavy Meadow - A lovely mustard yellow creme. Its formula was quite sheer for its first coat unlike the others here, but it covered well in the next coat. These kind of yellows are my favorite from the yellow family. Shown here are 3 coats plus top coat. You can get this collection at Pear Nova online shop.